Standard unit for individuals up to 6'4". 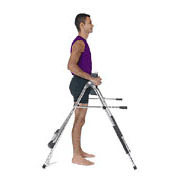 Easy to mount and dismount. The thigh pad is attached to a crossbar which has a low center of gravity allowing the user complete control when inverting or dismounting. This unique design makes this an ideal unit for patient in-home use. The thigh pad has been designed to reduce pressure in the pubic area during inversion sessions and when performing extension/flexion exercises. Rubber side grips for safe and easy inversion and dismount. Fully adjustable for patient leg length, thigh thickness and height - maximizing comfort and traction during each inversion session. M-Beam at front allows for extra-gentle extensions. Designed and built for the professional. Chrome-plated, heavy duty steel tubing and vinyl components will give years of trouble free use. 99% assembled - ready to use just minutes from unpacking. Simply attach the thigh pad and slip on the adjustable restraint bar. Folds completely flat for easy transportation and storage. Tested to safely hold up to 350 pounds. Accommodates most individuals up to 6'4". Optional kit extends to 6'8".